EPA Administrator Scott Pruitt claims the new rule will strengthen transparency. Scientific organizations worry it will exclude valuable data from EPA's rule-making process. 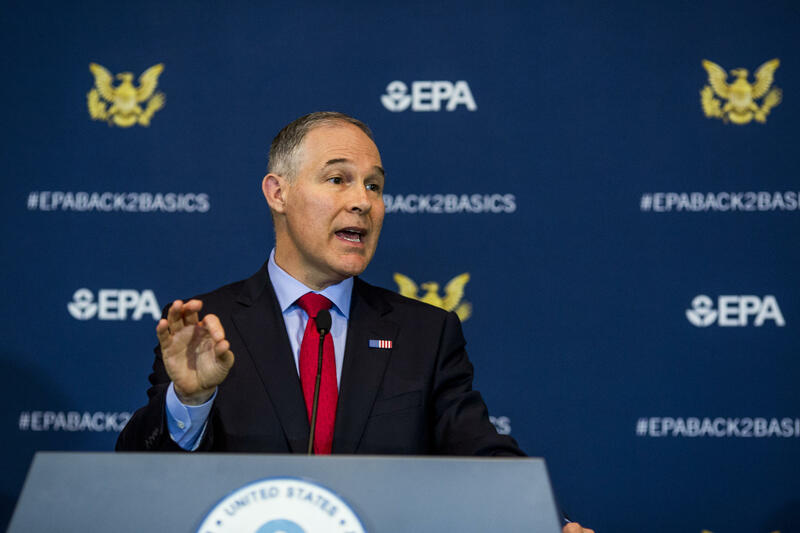 "The American people ought to be able to have confidence, assurance, that the findings, the record that we build ... can be assessed, it can be evaluated, it can be analyzed," Pruitt said. The Heartland Institute, a conservative think-tank, has commended Pruitt on the rule. "For decades, the EPA has improperly claimed massive power to regulate nearly every aspect of our economy and lives. It is long overdue that the EPA should make such data and collection methods available for public review and analysis," Tim Heulskamp, the think tank's president said in a statement. But several scientific organizations have expressed concerns. "Our concern with this is they are quite literally limiting the best available science that can be used by the EPA," says Sean Gallagher, the senior government relations officer for the American Association for the Advancement of Science. The EPA's regulatory decisions are often based on epidemiological studies looking at the potential health effects of pollutants, like pesticides and particulate matter. "Those studies involve people like you and me, signing confidentiality agreements that the scientists doing the studies won't reveal my personal health information, like my vital statistics, or my death certificate, if I die during the course of the study," says Gallagher. "This is the kind of science that the EPA relies on, whether it looks at chemicals or particulates and their mortality or health effects. It involves private data." And this private data can't be made public, he says. And so, it limits the studies available to the agency for any decision-making, he adds. "It would not help make the science any more transparent," says Andrew Rosenberg, of the Union of Concerned Scientists, an advocacy group representing scientists. When he proposed the new rule, Pruitt talked about a "replication crisis," referring to scientific studies that can't be reproduced. But that crisis applies more to the field of clinical trials, says Rosenberg, where new drugs are being tested for their efficacy. "That's very different from what the EPA does," he adds. The agency often relies on studies that involve long-term surveys of exposure to certain environmental pollutants and associated health effects. "What are you supposed to do? Go back in time in five years and redo the survey? That's really a false flag." The new rule would only restrict the science used by the agency and limit the agency's ability to protect public health, he says. It could affect the agency's ability to protect the public from everything from air and water pollutants to household products. "The scientific process is [already] incredibly transparent," says Gallagher. "It's evidence-based, it follows the facts where they go. It tries to root out bias." "The agency should be able to use all good, peer reviewed, scrutinized studies," he adds. "It shouldn't be limiting the science."